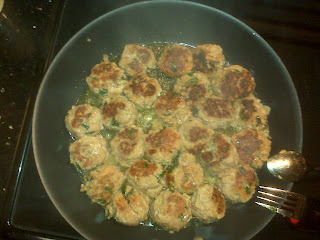 My friend Katie has been raving about these meatballs for a long time. She frequently cooks them for dinner and then she and her husband eat the leftovers as a meatball hoagie the next day. I was inspired, they sounded delicious and honestly I have never made meatballs before, although I have eaten plenty of them. This recipe did not disappoint! The meatballs are amazing, we ate them two nights in a row. Matt preferred his over spaghetti noodles but I just ate mine plain because they had so much flavor! This recipe is so tasty and simple to make. I've been getting alot of great feedback about my recipes so I am thinking about starting to feature recipes twice a week. This will give me incentive to cook more and try out some new recipes! Send me any suggestions of recipes you would love to see. Looks yummy! This is making me want my mom's spaghetti! I like the idea of recipe posts. These look good - I'll have to try them. My 2.5 calls that movie, "the meatball show".